If you’re like most Texas residents, then you’re probably as excited as we are about summer road trips and the exciting events the summer brings. Whether you’re taking your RV out for a weekend camping trip or you’re traveling across the country, an RV is the perfect way to stay comfortable and safe during your travels. With RV ownership currently at a record high, it’s no secret that the RV industry is been growing at a rapid pace. In today’s post, we’ll take a look at the most recent data about the RV industry from the Recreational Vehicle Industry Association. No matter where you’re going this summer, you should make sure that you’ve invested in an RV service appointment before you hit the road. Your RV may have been sitting dormant for several months, and an RV service appointment will allow you to address any repairs or maintenance that need to be performed. Get in touch with MobileTech RV Repair to schedule RV service in Montgomery County, and continue reading below to learn more about the RV industry! The state of the RV industry couldn’t be better, and it’s been increasing yearly for eight consecutive years. There were 430,691 RV shipments in 2016, a significant increase of 15.1 percent from the shipments in 2015. 2017 was an even better year, boasting a massive increase of 17.2 percent (504,599 RVs). The growth of the RV industry isn’t just good for RV retailers — it’s great for the economy, too. 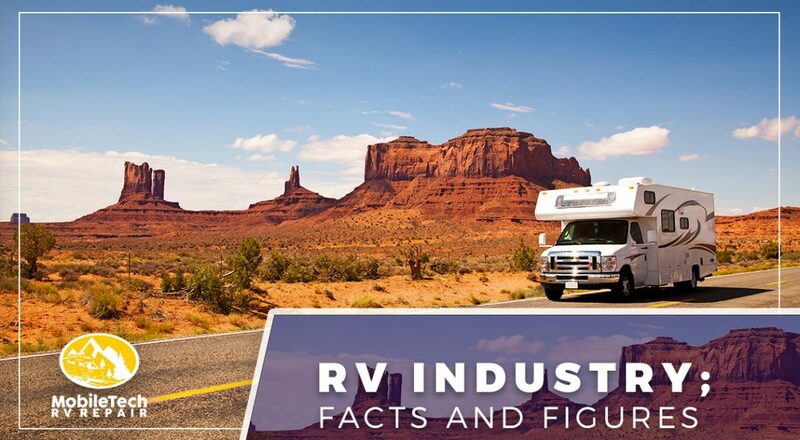 In fact, RV manufacturers employ more than 30,000 employees at approximately 230 RV manufacturing plants! While this number may not seem large when you consider the size of the United States, the economic impact of the RV industry is enormous. Campgrounds for RV owners alone have generated 45,150 new jobs in the United States, and while the overall direct economic output of the RV industry in 2017 is still being compiled, the 2016 figure is a whopping $27 billion — that’s certainly nothing to laugh at! Why is the RV industry growing at such a rapid pace? The primary reason is that an RV is a great investment — using an RV for a family or two-person vacation is nearly always cheaper than staying in a hotel or resort. You’re able to sleep in a comfortable bed, eat your own food, avoid pit stops to use the bathroom, and you never have to worry about taxis or car rentals. A simple RV service or RV maintenance appointment before you hit the road is all you need to ensure that you make it to your destination safely! Another reason for the continuing growth of the RV industry is that Americans of all ages are investing in RVs. While older retirees often use RVs as a way to travel the country, travel-oriented millennials are also investing in RVs for camping, sightseeing, tailgating, and taking cross-country trips with their friends. We hope that you’ve enjoyed this post — stay tuned for future updates about the state of the RV industry in the United States! Contact MobileTech RV Repair today for RV service, RV repair, and RV remodeling in Montgomery County! We look forward to working with you soon.